As you've been reading in my recent posts, I was in New Orleans. My husband was there for a medical convention. While he was busy I drove our rental car to the Louisiana Archives in Baton Rouge, the Washington Parish Library in Franklinton and the McComb Library and Mississippi. I looked through family genealogies, local histories, church and cemetery records and looked for my surnames. I made photocopies and digital copies of pages that looked like they might be relevant for further analysis at home. On our last evening in New Orleans was the best fun. My husband and I had dinner with my second cousin, Cindy! We share great grandparents, Jasper Pascal Brown & Rose Ella Brumfield. My paternal grandfather was Roy J. Brown and Cindy’s maternal grandmother was Roy’s sister, Lyda Mearl Brown, both born in Mississippi. As genealogists we are all about people but we often spend our time alone, gathering information in quiet libraries or searching the internet. It is wonderful when we can get together with our cousins in person. Cindy & I had met once before, several years ago. My children remember that encounter because the power went out while we were visiting. It was the second cousin visit in two days with a power outage! This time the lights stayed on, we had a delicious seafood dinner and abundant conversation. We agreed we need to find another time to talk again. I hope all your genealogy travels are as fun and rewarding as this trip. 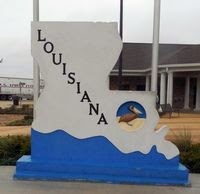 Travel Tuesday - Louisiana - Part 4 - and Mississippi Too! "Progress. Services for George Howard Alford, 83, prominent Pike county farmer, writer and community leader who died Sunday, were held at 2 p.m. Monday at Progress Baptist church. Mr. Alford died at 2:35 a. m. at St. Dominic Hospital at Jackson following a trip to Mississippi State College where he attended an alumni meeting. He was a veteran farm leader, editor and former Pike representative. He excelled in all these fields, and he was Pike County’s first county agent and was the first federal agent of agriculture in the United States. He was a Baptist, deacon and Mason. 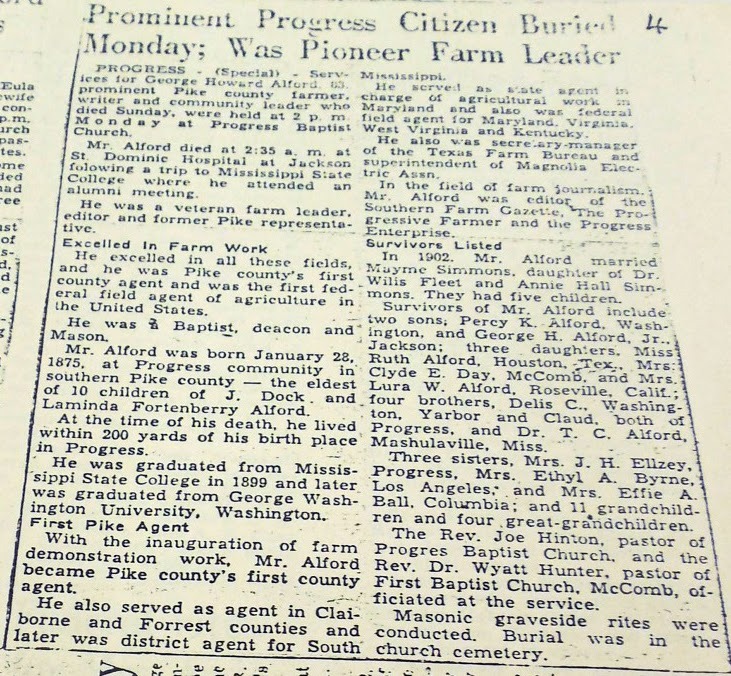 Mr. Alford was born January 28, 1875, at Progress community in southern Pike county – the eldest of 10 children of J. Dock and Laminda Fortenberry Alford. At the time of his death, he lived within 200 yards of his birth place in Progress. He was graduated from Mississippi State College in 1899 and later was graduated from George Washington University, Washington. With the inauguration of farm demonstration work, Mr. Alford became Pike county’s first county agent. He also served as agent in Clairborne and Forrest counties and later was district agent for South Mississippi. He served as state agent in charge of agricultural work in Maryland and also was federal field agent for Maryland, Virginia, West Virginia and Kentucky. He also was secretary – manager of the Texas Farm Bureau and superintendent of Magnolia Electric Assn. 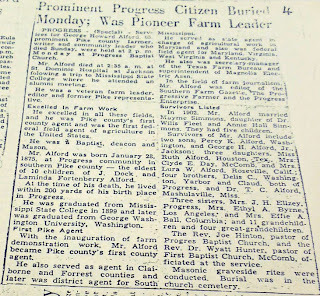 In the field of farm journalism Mr. Alford was editor of the Southern Farm Gazette, the Progressive Farmer and the Progress Enterprise. In 1902, Mr. Alford married Mayme Simmons, daughter of Dr Willis Fleet and Annie Hall Simmons. They had five children. Survivors of Mr. Alford include two sons, Percy K. Alford, Washington, and George H. Alford Jr., Jackson; three daughters, Miss Ruth Alford, Houston, Tex., Mrs. Clyde E. Day, McComb, and Mrs. Lura W. Alford, Roseville, Calf. ; four brothers, Delis C., Washington, Yarbor and Claud, both of Progress, and Dr. T. C. Alford, Mashulaville, Miss. Three sisters, Mrs. J. H. Ellzey, Progress, Mrs. Ethyl A. Byrne, Los Angeles, and Mrs. Effie A. Ball, Columbia; and 11 grandchildren and four great grandchildren. The Rev. Joe Hinton, pastor of Progress Baptist Church, and the Rev. Dr. Wyatt Hunter, pastor of First Baptist Church, McComb, officiated at the service. Masonic gravesite rites were conducted. Burial was in the church cemetery." This prompt comes from Amy Johnson Crow at her blog, No Story Too Small. She suggests we “write once a week about a specific ancestor. It could be a story, a biography, a photograph, a research problem — any that focuses on that one ancestor.” Thanks, Amy, for the suggestion! I have decided to begin with my grandparents and to work back in time to my great grandparents, etc. Here is my maternal grandmother, my much loved Nana. Helen was born and lived most of her life in New York City. She was the daughter of MichaelCoyle & Mary Josephine Mullane. Helen was the oldest of seven children. Her siblings were: Francis, Marion, Marguerite, Thomas, Lillian & Kathleen. My Nana, Helen Coyle Gardner, used to tell me many stories about the adventures of the five Coyle sisters. To me the stories of these sisters were wonderful, magical tales that would transport me back in time to the streets of New York City. Perhaps it is the Coyle sisters’ same love of storytelling that impels me to share these stories. Here is one of those stories. New York City was divided into neighborhoods. The Coyles lived in an Irish neighborhood. One day the girls were invited to visit a friend who lived in ‘Little Italy’. Helen, Marion and Margie brushed their hair, put on their best frocks, and set out for a nice visit. Their friend was glad to see them. She introduced the girls to her family and invited them to sit in the parlor. Parlors were living rooms that were used only for company and special occasions. Everything was kept neat and clean and children were not allowed to play there. The sisters felt like young ladies being entertained in the parlor. Conversations with the family were difficult. The Coyle sisters could not understand their girlfriend’s parents who spoke only Italian. The girls smiled, nodded and relied on their friend to translate. The sisters were always on their best behavior. In 1910 and 1915 the Michael Coyle family rented an apartment on Third Avenue in Manhattan. The children lived at home and went to school. In 1920 they were living at 223 E 113th Street in Manhattan. Helen found a job at the Western Union Telegraph Company where she earned $12 a week. She had to bring her pay home to their mother who kept $11 and let Helen keep $1 a week. Her boss was NathanielGardner who had worked for the Western Union since he was a delivery boy. He flirted with Helen, teased her and gave her flowers. On 9 May 1921 Helen & Nathaniel Gardner were married. Helen continued to work until their only child was born. Alberta Joy Gardner was born 26 March 1928 in the Bronx. In 1940 the Gardners were living at 2856 East 197th Street in the Bronx. Nathaniel was still working at Western Union and Joy was going to school. Nathaniel was not well and his doctor said his health would improve if he would move to the country. In 1941 the Gardners bought a house in Columbia Co., NY. Nathaniel worked in NY City and took the train north on weekends. He planned to retire and live in the country full time but World War II began and telegraphs were important for communication so he kept working. On 7 December 1944 Nathaniel died. Helen and Joy were heartbroken. They decided to stay in the country rather than return to New York City. Helen, who had been a city girl, learned about country life. She raised chickens, planted a vegetable garden and learned the names of all the birds around her house. She raised her daughter alone and they always remained very close. Helen died 13 October 1965. She was buried beside her husband with a stone that simply says: Mother. Her love and laughter are still missed today. Certificate and Record of Birth; 1897; City of NY Depart of Health, State of NY, Manhattan, #2566; Nellie Coyle, born 9 Jan 1897. 1900 Federal Census Soundex, Manhattan; 1900; Vol.178, E.D. 930, Sheet 2; Line 72; NY State Library, Box 106; NOTES: 159, 113th Street, Manhattan; Michael Coyle family. 1910 US Census, Third Ave, Ward 12, Manhattan, NY City, NY, S. D. 1, E. D. 330, Sheets 16 A & B. Michael Coyle family. Family Stories told by Helen Coyle Gardner and Marion Coyle McCall, to Colleen G. Brown Pasquale, in the 1960’s. 1910 US Census, New York, New York, Manhattan, Ward 12, Third Avenue; SD 1, ED 330, Sheets 16 A & B. 1915 NYS Census, New York City, ED 9, AD 28, block 1, pages 2, 3; Michael Coyle family at 2033 Third Avenue. 1920 Federal Census, New York City; 1920; Vol.279, E.D.1292, Sheet 18; Line 70; New York State Library; NOTE: 223 E.113th Street, Manhattan. The Michael Coyles. Marriage License #13781, NYS Dept. of Health; 1921; County of New York, Division of Vital Stats; Nathaniel Gardner and Helen Frances Coyle, May 9, 1921. Birth Certificate for Alberta Joy Gardner, 26 March 1928, #4709, State of New York, City of New York, Department of Health. 1940 US Census, New York State, Bronx, SD 24, ED 3 - 814, Sheet 11B. Nathan Gardner at 2856 East 197th Street. Transcript from the Register of Deaths, #261; 1965; Registrar of Vital Stats., City of Hudson, Columbia Co., New York; Helen Gardner, d. 13 October 1965. I have decided to begin with my grandparents and to work back in time to my great grandparents, etc. Here is my maternal grandfather. 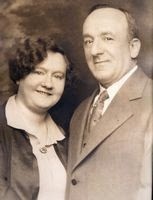 His parents, Leopold Gartner & Fannie Edelstein, came from Austria. Nathaniel and his siblings were the first generation Americans. Nathaniel was born 21 July 1882 in New York City. He was the second child of Leopold Gartner & Fannie Edelstein. His older sister was Florence Gartner Weissberg. His younger siblings were Arthur Moses Gartner, Albert Gartner and Anna Gartner Beaman. In 1900 the Gartner family was living in Manahattan. Leopold was a tailor and Nathaniel was a telegraph operator. In 1905 the family lived on East 78th Street. Nathaniel and his brother, Moses, were both telegraphers. Older sister, Florence, was a clerk. The children were expected to contribute to the family’s finances. Nathaniel Gardner worked for the Western Union Telegraph Company for many years. As a boy he was a delivery boy, taking telegrams to customers. The telegraph was the first device to send messages by electricity. Telegraph messages were sent by tapping out a message with a telegraph key. Morse code was used to send the messages over the wire. As a telegrapher, Nathaniel earned the nickname ‘Sparks.’ The telegraph key that he used is still in the family. At times he would leave the Western Union for other jobs, but he would always return. At times Nathaniel worked as a telegraph operator on a freighter. The boat would leave from New York Harbor for California. When Nathaniel was 25 he was on a freighter that arrived off the coast of San Francisco on the 21 April 1906. This was just three days after the famous San Francisco Earthquake. The earthquake shook the city at 5:13 a.m. on 18 April 1906. Fires broke out all over the city. Broken water mains made it impossible to put out the fires. Three thousand people died in the disaster and 250,000 people lost their homes. Most of the city, more than 28,000 buildings, lay in ruins. When the freighter arrived off shore three days later, the city was still in flames. Imagine what a sight Nathan saw from the deck of the ship. In 1910 the family was at 56 West 118th Street  Leopold was 56 and widowed. Moses, Albert and Anna, all single, were living with their father. Moses was working as a telegrapher at a telegraph company; Albert G. was working as a salesman at a dry goods store; and Anna was without a job. Nathaniel lived on his own. He was a lodger at 290 West 147th Street and an operator at a telegraph company. The US Congress declared war on Germany on 1 April 1917. In 1918 Congress passed the Selective Service Act that provided for a draft of men between the ages of 21 and 31. Draft records show that Nathaniel Gardner was a telegrapher at the Western Union Telegraph Company. He was of medium height and build, with brown eyes and black hair. Nathaniel did not serve in the War, probably because of his asthma. In the year 1920 another federal census was taken. On 15 January 1920 the Gartner family was still 234 West 120th Street with Leopold as head of the household and three adult children living with him. Nathaniel, Moses and Anna were all single and all telegraph operators. Nathaniel’s mother had died before the census. His brother, Albert, died soon after. By this time Nathaniel was the manager of a Western Union branch. One of his employees was a young woman named Helen Coyle. He flirted with her and left flowers on her desk. She was the oldest child of Michael Coyle & Mary Josephine Mullane, both born in Ireland. There were many reasons they should not have made a good couple; the big difference in their ages and their religions. They walked together in Central Park. They went out on a rowboat in the lake in the park. In 1921, despite their families’ objections, they went to City Hall and were married. Both families disowned them. In 1925 Nathaniel & Helen were living on Mt. Eden Street in the Bronx. Both Helen and Nathaniel were both telegraphers. They wanted a family but no child appeared for several years. Alberta Joy Gardner was born 26 March 1928. She was named for her paternal uncle, Albert Gartner who had died a few years before her birth. Once she was born Helen stayed at home with her daughter. In 1930 they were living at 1527 Plymouth Avenue in the Bronx. In 1940 Nathaniel, Helen & Joy were at 2856 East 197th Street, Bronx. In 1941 Nathaniel’s doctor strongly suggested he needed country air to improve his health. He still had asthma and his heart was not good. The Gardners bought a small house in Columbia County, NY. Nathaniel had a small apartment in NY City and took the train north on the weekends. He was ready to retire. However, circumstances changed. World War II was declared. Telegrams were important methods of communication and Nathaniel was needed to continue working. 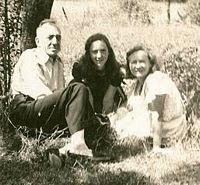 On 7 December 1944 Nathaniel was home with his wife. He told her he was feeling tired and he went upstairs to have a nap. When Helen checked on him she discovered that his heart had given out. From the front yard of their little house you can see the country cemetery was he was buried. I have always wished I could have met Nathaniel. Family stories tell me he loved to laugh. He did magic tricks for children. He liked to spoil his daughter and I was always sure he would have done the same for me, his only granddaughter. New York State Operator's License; 1923-1924; New York State Tax Commission; #272036; In poss of Colleen G. Pasquale, Averill Park, NY; "Nathan Gardner", 216 Mt. Eden Ave., NYC. Born 1882. 1900 Federal Census, Manhattan, NY; 1900; Vol.169, E.D. 804, Sheet 16; Line 64; New York State Library, Albany, NY; Gartner family at 445 East 83rd St., Manhattan. 1905 New York State Census, New York County, Manhattan; ED 13, AD 30, Block A, Page 8; Louis Gardner family on East 87th Street. Interviews with Alberta J Gardner Brown, daughter of Nathaniel; conducted by Colleen G Brown Pasquale. Interviews with Alberta J. Gardner Brown. World Book Encyclopedia, Volume 17 (Chicago: World Book, Inc. 1990), 97 - 98. New York City Directory, 1910, NY Genealogical & Biological Society Record Search, 4 April 1996, 122 E 58th St, NY, NY. 1910 US Census, NYS, New York City, Manhattan; SD 1, ED 491, Sheet 4B. Leopold Gardner family at 58 West 118th Street. 1910 US Census, NYS, New York City, Manhattan; DS 1, ED 514, Sheet 1B. Nathan Gardner at 290 West 147th Street. Trager, James. The New York Chronology. New York: HarperResource, 2003. “World War I Draft Registration for Nathan Gardner,” September 1918, Draft Board 169. Ancestry.com (online database) Provo, Utah. National Archives and Records Administration, M1509, Roll 1787087, Washington, D.C.
 1920 US Census, NY, New York City, Vol. 280, E.D. 1319, Sheet 14, Lines 26-29; NYS Library, Albany, NY. Leopold Gartner family at 234 West 120th St. Marriage License for Nathaniel Gardner and Helen Coyle, #13781, 9 May 1921, New York Dept of Health, County of New York, Division of Vital Statistics. New York State Census 1925; AD2, ED56, p. 51. Address: 217 Mt. Eden Avenue, Bronx. Nat Gardner. Birth Certificate for Alberta Joy Gardner, 26 March 1928, #4709, State of New York, City of New York, Depart of Health. 1930 United States Census. ED3-400; Sheet 14B; New York City: Bronx; 1527 Plymouth Avenue; the Nathaniel Gardner family. US WWII Draft Registration card serial #682; Nathan Gardner, age 60. Transcript from the Register of Deaths, #9; 1944; Public Registrar, Germantown, Columbia Co., NY; Nathan Gardner, d. 7 December 1944. Age 62, b. 21 July 1882 in NYC. 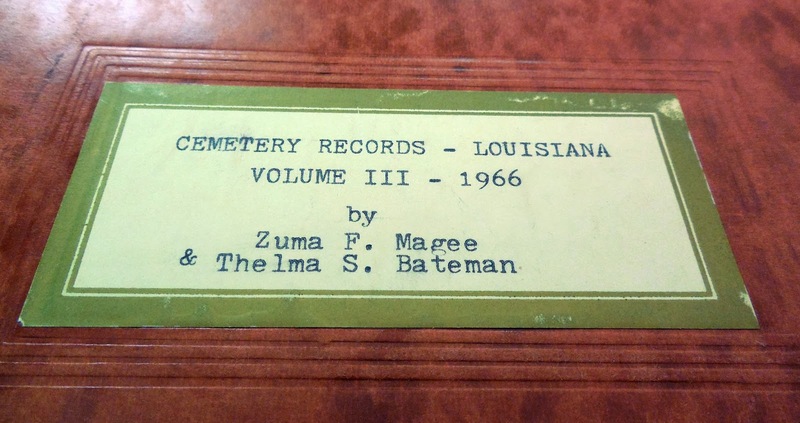 Magee, Zuma F., and Thelma S. Bateman. Cemetery Records - Louisiana. Volume III. Franklinton, Louisiana: Privately printed, 1966.Smith Cemetery. From the Washington Parish Library, Franklinton, LA. 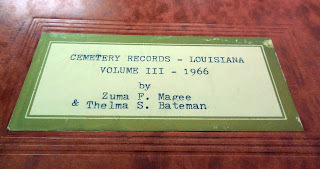 I found this book in the Franklinton Library, LA. It’s more of a report, actually, typed pages in thick folder. It lists several cemeteries in Louisiana, where some of my families settled and were laid to rest. This is exactly the kind of resource I like to uncover because it cannot be accessed by internet. You have to visit the library to read the data inside.